Normally when you order an Uber or a Lyft, the car that arrives is pretty modest. Maybe a Honda Accord, a Ford Fusion, or a Toyota Prius. I would bet that the average price of an Uber or Lyft car is around $25,000. You might periodically get picked up in the rare Mercedes or BMW, but for the most part, the cars are fairly unremarkable. Not trying to be mean, but the drivers also tend to be fairly unremarkable. Don't get me wrong, pretty much ever driver I've ever had was extremely friendly. From what I've gathered, most people who drive for Uber and Lyft, do it to supplement their income outside of a normal job. I've been driven around by a ton of teachers, struggling actors, musicians… even a few budding tech entrepreneurs trying to raise money for their revolutionary app idea. 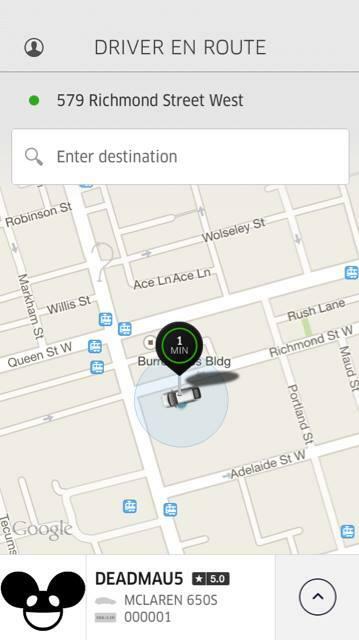 A handful of Toronto citizens had a very different Uber experience earlier this week. Imagine ordering up an Uber and being told that your driver "Deadmau5" would be arriving shortly in a white McLaren 650S. A white McLaren 650S that is worth over $300,000 dollars. Deadmau5 has announced that he is leaving Universal to join indie distributor Kobalt. Why is he making the move? Check out the details here. While some DJs spend $15 million on houses, Deadmau5 "only" spends $5 million. He then uses the opportunity to make fun of his over-spending peers.